An additional furnace will be built on its ethylene plant at the 1,700-acre site. The company said the investment showed its commitment to UK manufacturing at a time when it is in decline across many industrial regions around the country. The addition of a 10th furnace will improve the efficiency of the plant and increase its production capacity. 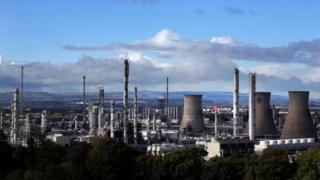 Ineos announced last summer it would boost the amount of ethylene it can produce at Grangemouth and in Norway. It follows the opening of a new supply of fracked shale gas that is now shipped to Europe from the US. John McNally, chief executive of the company's olefins and polymers division, said: "Our plans to invest in the UK with the further expansion of our plant at Grangemouth has been made possible because we now have access to the raw materials that we need. "The successful completion in 2016 of our project to bring to Grangemouth plentiful supplies of competitive US shale gas ethane over a long-term agreement, has breathed new life into the plant. "Production from Grangemouth provides vital raw materials used extensively throughout UK industry. "Having additional furnace capacity will provide a range of future opportunities, not just for Ineos and for the site, but also for the heartlands of manufacturing in Scotland and the North East and North West of England."